Coton de Tulear Dogs - The Coton de Tulear is a small toy breed of dog, developed in Madagascar as a companion breed. 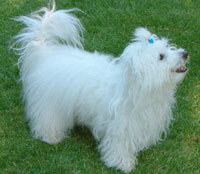 The Coton de Tulear has a medium-length, fluffy, cotton-like coat that is hair rather than fur. There are three equally favorable colorings: white, black-and-white, and tri-color. The Coton de Tulear is a playful, affectionate, intelligent breed. It loves people and life and is enthusiastic and lively. It is a very vocal breed, grunting and making other noises when having fun. Some Cotons have a habit of walking on their hind legs to please people. Cotons may exhibits shyness or cautiousness in new situations, especially around strangers, but this can be overcome with training. The dogs are very trainable with praise, instead of punishment, as they thrive to please people. This information is licensed under the GNU Free Documentation License. It uses material from the Coton de Tulear article on Wikipedia.org. Coton de Tulear Breeders - Advertise your kennel puppies and dogs here.